On the evening of March 30, Thomas Crosson was grabbing a slice of pizza at Amalfi Pizza near SunTrust Bank, and watched as large flames rose from a section of the Interstate 85 in Atlanta, causing it to collapse. "It was funny to watch everyone gather around the TV. Even the cooks came out from behind the kitchen and all of them had the same expression on their face," Crosson said. Shortly after, Crosson, a spokesman for SunTrust Bank, said emails from his managers started coming in with travel tips. 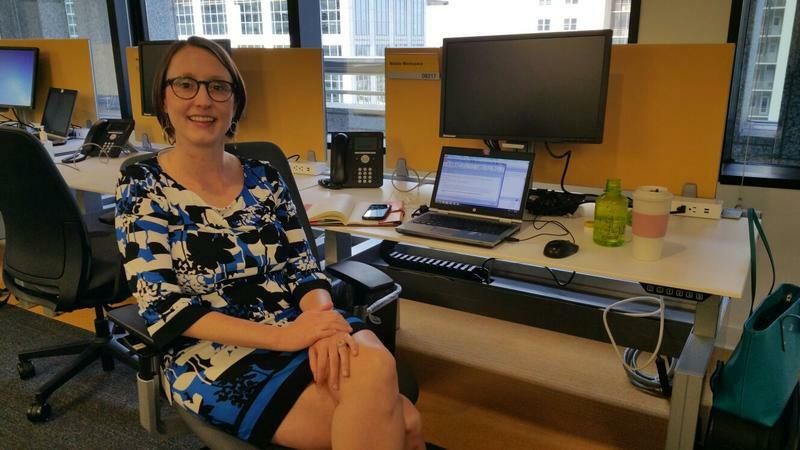 The I-85 bridge reopened on May 13, but during the six weeks it was closed, Atlanta-area businesses pushed workers to take advantage of telecommuting. Some employees said they will continue working from home. At SunTrust Bank, the company already had a popular telecommuting program that went into full gear after the bridge collapse. The company sent out reminders of its telecommuting options, discounted MARTA passes and SunTrust remote satellite offices available to employees at Perimeter Center and Conyers. On the eighth floor of the Midtown headquarters, where Crosson works, you'll find large bean bag chairs, foosball tables, mini-golf courses and lots of empty desks. "Maybe on this floor that has probably 200 people, I would say 30 percent are working from home," Crosson said. Many of the desks are missing name plates. Employees can sit at any of the mobile workstations and lock their belongings in lockers along the wall. Most employees are given a work laptop and phone with access to the work network and use video or call in to meetings. 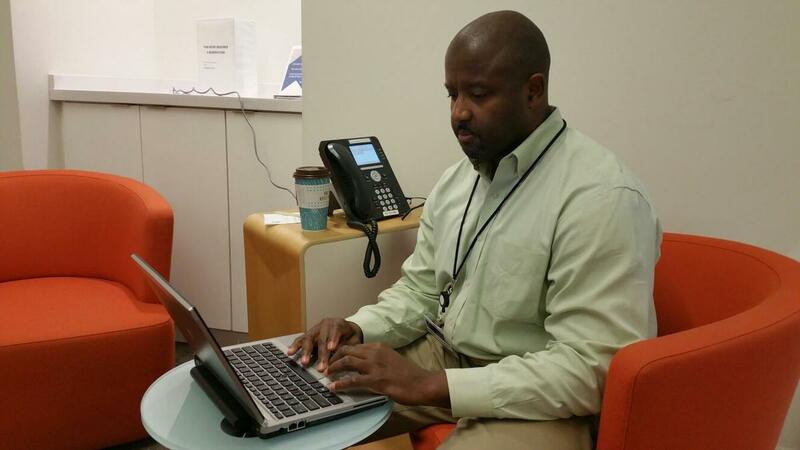 William Graham, a lead business analyst at SunTrust Bank, works inside a conference room he reserved at SunWorks, a mobile workspace for all employees on the ground floor of SunTrust Bank's corporate headquarters in Midtown Atlanta. Lead business analyst William Graham has an office on the sixth floor, but he comes down to the ground floor to work at a space called SunWorks. It’s where employees from all over the building are typing away on their laptops. It looks like a colorful library, without the books. When Graham started working at SunTrust, he was managing several employees and couldn’t tell if they were in the building or working from home. “I didn't know that [one employee] lived in Maryland until it was like about a month after I started the job," Graham said. He said because SunTrust intentionally advocates for telecommuting, it takes away some of the stigma of working from home. "You don't feel that it puts you at a disadvantage when you're working from home,” Graham said. “You have just as much position and just as much political voice and impact as anybody else that may be in the room." Telecommuting in Atlanta isn't just something we're seeing after the bridge collapse, Emory University economist Tom Smith said. He’s also on the recently formed emergency response committee at Emory and said the school encouraged him to work from home after the bridge collapse. Smith predicted even more people will work from home as businesses look to reduce what is often their number one cost: worker turnover. But even now that we're back to our regular traffic woes, Smith said telecommuting is a trend that's here to stay. “I think there’s been a trend in that direction because of the new workers entering the workforce that have shown that lack of flexibility often leads to unhappiness with those workers,” Smith said. He said research shows recent college grads expect schedule flexibility, which can lead to more loyal and productive workers. In that case, Smith said, companies may not care if employees do their laundry while they're on the clock.